The Customer is a public company and global leader among OTC brokers, offering web-based and mobile trading, and specializing in Forex, CFDs on stocks, indices, commodities, and cryptocurrencies. The Customer’s brokerage is regulated by the Cyprus Securities and Exchange Commission and the Financial Stability Board. It provides leverage up to 1:300. The Customer used an off-the-shelf trading solution for the brokerage, causing a vendor lock-in. They required a custom trading solution to meet their demands in terms of onboarding and implementation of the Customer’s proprietary widgets. These means were aimed at boosting the Customer’s revenue. They also required a subsequent transfer of a trading platform source code in order to avoid vendor lock-in and to increase capitalization. The Customer chose Devexperts due to their ability to develop a custom trading solution with seamless client onboarding and introduce the Customer’s proprietary widgets. Devexperts also agreed to adjust the Customer’s sales funnel to the new solution and transfer the trading platform source code after its successful launch into production. The first stage was the implementation of the trading platform frontend and order management system with the sales funnel connection. It was aimed at the seamless onboarding of new clients when users followed the ad link and landed directly on the profile registration page integrated into the trading platform. The reworked onboarding process provided a significant increase in the Customer’s revenue. The basis for this solution was dxTrade, a Devexperts product. dxTrade is a trading platform with a vast array of brokerage business functions. 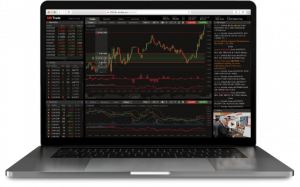 It supports a multitude of asset classes, such as FX, CFD, SB, stocks, commodities, futures, options, funds, and cryptocurrencies. It also has a modular structure with a variety of components and trading widgets, such as charts, risk management, pricing, trading analytics, compliance, and wealth management applications. They ensure the availability of the entire spectrum of platform functions ready to be integrated into the Customer’s existing infrastructure and licensed to them. The second development stage centered around fine-tuning the trading platform and implementation of the Customer’s widgets. After this, all of the Customer’s demands were met, and the trading platform was launched into production. The third stage amounted to licensing the source code to the Customer and making sure they were ready to maintain the solution on their own. After the source code was sold, Devexperts started a knowledge transfer process that took almost a year. It involved the creation of a knowledge base and training of the Customer’s development team. This team was freshly hired for the express purpose of the in-house development and maintenance of the proprietary solution. The ownership of the trading platform source code also provided the Customer with capitalization growth.